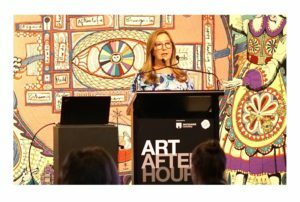 I presented this Colour Talk at Art After Hours at the Art Gallery of NSW, 24 October 2018. In conjunction with the Modern Masters from the Hermitage, this Colour Talk focused on the way in which Impressionist painters applied colour to great effect and drew a parallel with colour in branding and social media. Impressionist painters enjoyed a larger range of accessible paints and pigments. This was due to the proliferation of new, synthetic pigments arising from the Industrial Revolution. In addition, the invention of the screw-cap metal paint tube by Winsor and Newton occured in 1842. Painters like Manet, Monet, Matisse and Kandinsky came to apply colour in a vastly different way to painters before them. In part, they were influenced by the popularity of Japanese woodblock prints which, due to the printing process, break imagery down into areas or patches of colour. Some painters at the time were influenced by the writing of Michel Eugene Chevreul. Chevreul’s theories revolved around complementary colour and the impact these have. Painters like Seurat and Pissaro applied paint in dabs or patches of complementary colour. In addition, French poet and art critic Charles Baudelaire suggested that painters should “evoke reality, not by detailing its forms, but by using a line or patch of tone to stimulate the spectator to recreate reality through the act of imagination”. As a result, ‘patches of colour’ came to be a key element in many of the paintings of this period. At around the same time, colour printing processes and techniques vastly improved. This allowed for coloured advertisements and coloured logo designs and branding. It did not take long for the Impressionists’ ‘patches of colour’ to segue into colour as a key element in branding. In the age of social media, colour is one way for clever creatives and entrepreneurs to create differentiation. Listen to the 24 minute talk here. More information about the talk at the Art Gallery of NSW website.